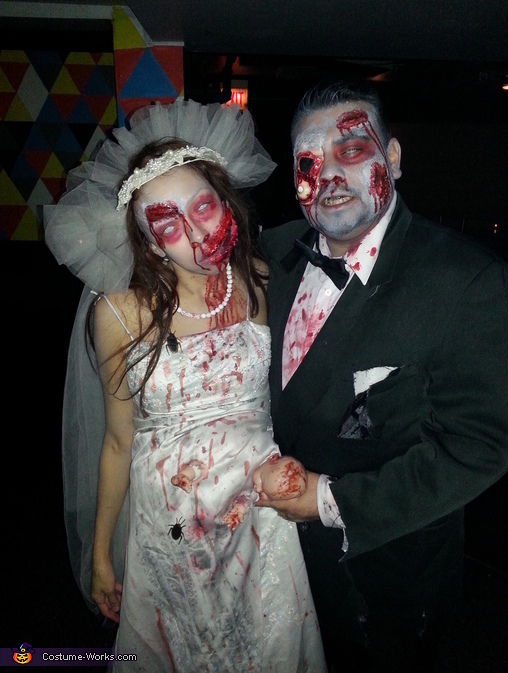 Hi I'm Veronica and last year for Halloween my husband Angel and I dressed up as a zombie bride and groom. We loooove zombie movies and shows so this is where the idea came from. We bought our costumes, the wedding dress and tuxedo from the local thrift store. I found an old baby doll of my daughters and sewed a bag with pillow filling in it. Then i sewed on two long strands on the side to tie around my stomach and put my dress on tore a little hole in it and popped the baby's head right out as if the baby was bursting out if my stomach as a baby zombie. We bought all white contact lenses and lots of different color makeups. We even made our own blood from corn syrup, red food coloring and chocolate syrup to get a much deeper red and make it more realistic. I used toilet paper with regular school glue layer by layer til i got desired results.Then ripped the toliet paper open to look as if my mouth was tore open drew in some teeth with a white eyeliner and put in purple makeup for brusing. Also made random scars all over our faces the same way. My husband bought a plastic eyeball and glued it to his face. Poured our homemade blood all over ourselves and walla zombie bride and groom. My costume cost about $50 in total and my husbands was about $40. The contact were the most expensive part of the costume. We had so much fun last year and scared so many people... We were a big hit!